Washington, D.C. October 29, 2004 - The Department of Defense has refused to release the names of military officers in the chain of command over the soldiers charged with prisoner abuse at Abu Ghraib prison in Iraq, according to an analysis of the documents posted today on the Web by the National Security Archive at George Washington University. DOD also refused to release the names of the officers who reviewed the so-called "Taguba Report," which recommended disciplinary and administrative actions for the abuses perpetrated at Abu Ghraib. The redactions of the names of the officers are in documents ordered to be released by a federal court in New York, in a lawsuit brought by the American Civil Liberties Union. The judge's order stated: "No one is above the law: not the executive, not the Congress, not the judiciary." Thomas Blanton, the National Security Archive director commented, "Either the black magic marker got completely out of control, or the Department of Defense is covering up the names of the accused abusers and the superior officers who allegedly condoned the abuse." The names hidden by the black redactions in the Department of Defense's court-ordered release are known because many of the same records are widely available on a variety of news media web sites, including the National Security Archive's own posting of July 13, 2004. "It is certainly possible that the redactions resulted from incompetence or more benign reasons," said Blanton. "Maybe it is just a case of trying to protect individual privacy. But I don't see how the privacy concern could apply to the name of Lieutenant General Ricardo Sanchez, who was the top commander in Iraq." The posting today overlays the redacted released documents with the previously available versions, highlighting the information censored by the Pentagon. NOTE: Names redacted from version released to the American Civil Liberties Union have been overlayed using previous releases of the Taguba report on news media Web sites. NOTE: The following documents were obtained by the American Civil Liberties Union in a lawsuit and posted to the Web on October 21, 2004. Click here to read the ACLU press release on receiving the documents, including the names of plaintiffs and attorneys in the case. Certification (AR-16 Investigation of the 800th Military Police Brigade) 06/04/2004 10/19/2004 DOD Chief of Military Justice's certification that the printed copy of the report is true and accurate. 10/19/2004 DOD Concludes that "US soldiers have committed egregious acts of abuse to detainees in violation of UCMJ and international law at Abu Ghraib (BCCF)." Taguba Annex #1 AR 15-6 Investigation--Allegations of Detainee Abuse at Abu Ghraib, Psychological Assessment by USAF Psychiatrist. Taguba Annex #3 Memorandum for Commander, Coalition Forces Land Component Command/CENTCOM from MG R. Steven Whitcomb 01/24/2004 10/19/2004 DOD Directs Commander CFLCC to conduct an investigation into the 800th MP Brigade's detention operations from Nov 1, 2003 to the present. Taguba Annex # 4 Memorandum for MG Antonio M. Taguba from CFLCC CDR David D. McKiernan 31/1/2004 10/19/2004 DOD Appoints MG Taguba to conduct an informal investigation into the 800th MP Brigade's detention operations from Nov 1, 2003 to the present. 10/19/2004 DOD Documents related to an investigation of 9 June 2003 investigation into riot and shootings of five civilian internees at Camp Cropper, Baghdad. Taguba Annex # 6 Report of Proceedings by Investigating Officer/Board of Officers re the escape, shooting and death of civilian internees from Camp Cropper on June 12, 2003. 10/19/2004 DOD Documents related to an investigation into the escape, shooting and death of civilian internees from Camp Cropper on June 12, 2003. 10/19/2004 DOD Documents related to the shooting of 4 detainees that contributed to a prison riot, cellblock shooting at Abu Ghraib. It finds Standard Operating Procedures, Rules of Engagement and Training were ineffective/inadequate; it also notes that a "clear cut chain of command does not exist in the prison. It is difficult to understand whom the Military Police work for, particularly in the MI hold area." Taguba Annex # 17 SIR report on disturbance in Ganci, Attack on MP 12/17/2003 10/19/2004 DOD Describes disruption during prisoner feeding. Taguba Annex #20 Assessment of DoD Counterterrorism Interrogation and Detention Operations in Iraq (Miller Report) 09/09/2003 10/19/2004 DOD Using JTF-GTMO operational procedures and interrogation authorities as "baselines," the report concludes after Miller's visit of Aug 31-Sep 9, 2003, that "detention operations function [in Iraq] must act as an enabler for interrogation"; recommends consolidating the interrogation mission at one Joint Interrogation Debriefing Center under CJTF-7 command (notes this action has been initiated); and states that "it is essential that the guard force be actively engaged in setting the conditions for successful exploitation of the internees." Taguba Annex # 21 Army Regulation 190-8, Enemy Prisoners of War, Retained Personnel, Civilian Internees and Other Detainees 10/01/1997 10/19/2004 DOD Army Regulation establishing "policies and planning guidance for the treatment, care, accountability, legal status, and administrative procedures for Enemy Prisoners of War, Retained Personnel, Civilian Internees and Other Detainees." The principal treaties relevant to this regulation are the Geneva Conventions. Art 1-5 provides that "[t]he inhumane treatment of EPW, CI, RP is prohibited and is not justified by the stress of combat or with deep provocation. Inhumane treatment is a serious and punishable violation under international law and the Uniform Code of Military Justice (UCMJ)." It prohibits "murder, torture, corporal punishment, mutilation, the taking of hostages, sensory deprivation, collective punishments, execution without trial by properly authority and all cruel and degrading treatment." Taguba Annex # 22 FM 3-19.40 Military Police Internment/Resettlement Operations 08/01/2001 10/19/2004 DOD This Field Manual depicts the doctrinal foundation, principles, and processes that Military Police will employ when dealing with enemy prisoners of war, civilian internees etc. It provides that the provisions of the Geneva Conventions are applicable to captives and detainees from the time they are captured until they are released or repatriated. . . . Detainees receive humane treatment . . . captives and detainees are not murdered, mutilated, tortured, or degraded." Taguba Annex # 23 FM 34-52, Intelligence Interrogation 05/08/1987 10/19/2004 DOD This Field Manual sets forth the basic principles of interrogation doctrine and establishes procedures and techniques applicable to Army intelligence interrogations. Taguba Annex # 24 The Fourth Geneva Convention 08/12/1949 10/19/2004 DOD Sets forth the protections due to civilian persons in time of war. Taguba Annex # 28 Interrogation Rules of Engagement (IROE) for 205th MI Brigade, Iraq. 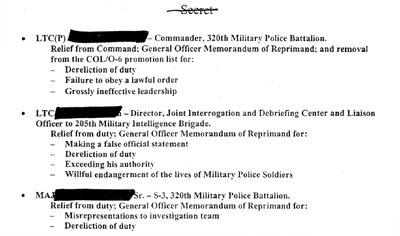 10/19/2004 DOD Sets forth two lists of techniques for use on detainees, of which one set (including isolation for more than 30 days and the presence of military working dogs) requires the Commanding General's approval; 4 accompanying pages are unreadable. Taguba Annex # 31 Frago 1108 11/19/2003 10/19/2004 DOD November 19, 2003 Fragmentary order assigning responsibility for Abu Ghraib to the Commander of the 205th MI Brigade, effective immediately. Taguba Annex # 32 Letters from BG Karpinski suspending several key leaders in the 800th MP Brigade and Rating Chains with suspensions annotated 01/18/2004, 1/19/2004 10/19/2004 DOD Names of suspended individuals are redacted. Taguba Annex # 33 FM 27-10, Military Justice 09/06/2002 10/19/2004 DOD Field Manual setting forth treaties relating to the conduct of land warfare which have been ratified by the United States. 10/19/2004 DOD An entry for Sep. 15, 2003 states "Per M.I., cell #9 can now leave his outer cell door open for ventilation and is off the light schedule. "; an entry for Sep 16, 2003, 1040 am notes that a detainee was placed in an isolation cell for fighting with IP's; for 1045 am, it notes, "continued with jail beautification for VIP's"; at 14.45 he notes that a detainee "was stripped down per M/I he is neked [sic] and standing tall in his cell. "; for Sep. 22, 2003, at 0005, another entry notes, "one OGA inmate moved to cell 1A25"; an entry for 29 Sep 03, 1130, notes, "moved 2 OGA prisoners to 4B for interrogation. "; an entry for Sep 29, 2003, 1415 notes "MI wants 150548 transferred to Iso[lation] for infor extraction pulled from 2B134 . . ."; anentry for Nov. 30, 2003 at 100 notes, "spoke with LTC Jordan about MI Holds in 1A/B. He stated he would clear up with MI and let MP's runA/B as far as what inmate gets (clothes). 10/19/2004 DOD This appears to be a blank form to record prisoner arrival and departure. Taguba Annex # 42 Joint Publication 0-2, Unified Actions Armed Forces, 10 July 2001 07/10/2001 10/19/2004 DOD Manual that provides the basic doctrine and policy governing the unified direction of forces and discusses the functions of the Department of Defense and its major components. Taguba Annex # 43 General Officer reprimand memos (from LTG McKiernan or BG Karpinski reprimanding various officers) 11/29/2003, 5/25/2003, 5/25/2003, 5/25/2003, 11/10/2003, 11/10/2003, 8/20/2003, 8/20/2003, 8/20/2003, 8/20/2003 10/19/2004 DOD Reprimands for having inappropriate relationships with junior female soldiers, consuming alcoholic beverages, fraternizing with drinking colleagues,, lack of leadership in preventing escapes, lack of leadership and failure in training on proper weapons as demonstrated by subordinate soldier negligently discharging an M-16 round while exiting his vehicle, rendering the vehicle inoperable. Taguba Annex # 46 Testimony of Thomas Pappas, Commander, 205th MI Brigade 02/09/2004 10/19/2004 DOD States that "LTG Sanchez gave me, in writing, a specific interrogation plan. We were under strict guidance. "; "if detainee abuse was brought to my attention, action was taken"; "if the interrogation plan falls within the outline set by LTG Sanchez then the 05 Deputy Director or myself approve the plans. Those interrogation plans include a sleep plan and medical standards. . . . based on LTG Sanchez's outline, the approval came from me. Myself or a senior person in the JIDC signed off on the interrogation plan and took it down to work it with the MPs. "; "I am not aware that a copy of the Geneva Conventions under AR 190-8 must be posted in the facility in the language of the country to which the detainees are being held. The Geneva Convention was not specifically posted in any of the facilities where the detainees were held. "; "The interrogation teams are predominantly MI." Taguba Annex # 92 FM 3-19.1, Military Police Operations 01/31/2002 10/19/2004 DOD Field Manual which is the foundation for all MP doctrine as it relates to the support the MP Corps provides to the commander. Taguba Annex # 102 Memorandum of Admonishment from [LTG Sanchez-Redacted], addressed to LTG Karpinski, 17 Jan, 2004 01/17/2004 10/19/2004 DOD Notes that "[I]n the past 6 months, incidents have occurred that reflect a lack of clear standards, proficiency and leadership within the Brigade. As the commander, I hold you ultimately responsible for these deficiencies. The reported detainee abuse incident at the Baghdad correctional facility (Abu Ghraib) is the most recent example of what I am increasingly concluding is a poor leadership climate that permeates the Brigade." Admonishes Karpinski and suspends platoon leader, company commander and battalion commander of the unites involved in the abuse incident.